Some very brief notes on a great though brief visit to WA with my mother. The map (based on maps from http://www.whereis.com/) shows the tiny part of the state we reached. 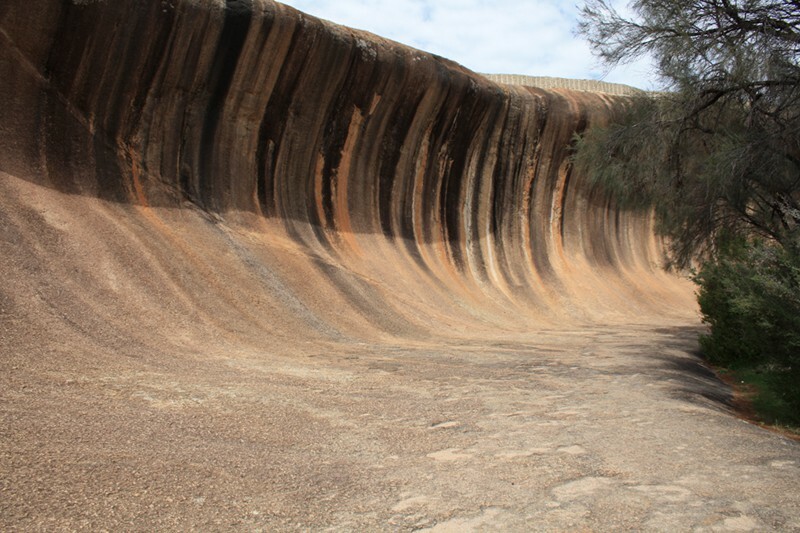 After a 5 hour flight west from Sydney to Perth we immediately drove east 4+ hours to Hyden. 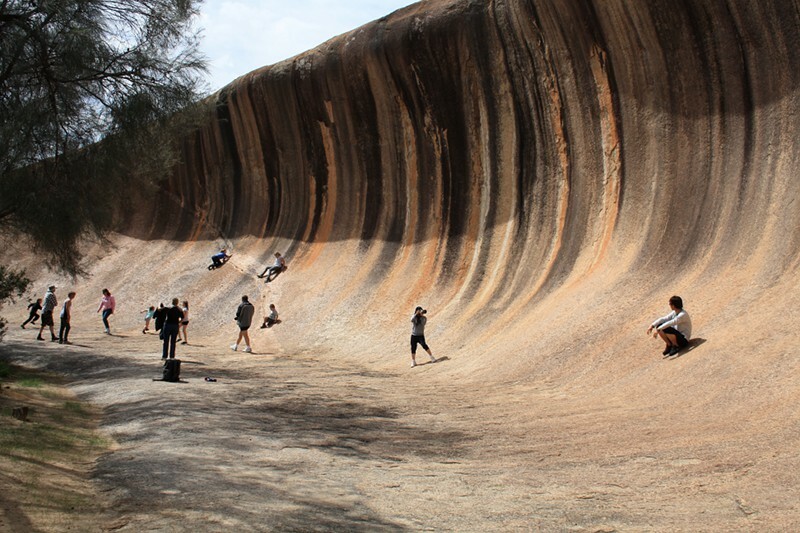 The attraction of this small country town is Wave Rock, which we discovered is only one small part of Hyden Rock. The thumbnail gives an idea of the scale of the rock face. Much of the colour is from lichens on the granite, and the strange structure you may be able to see on the top is a wall built decades ago to redirect water runoff into a dam. 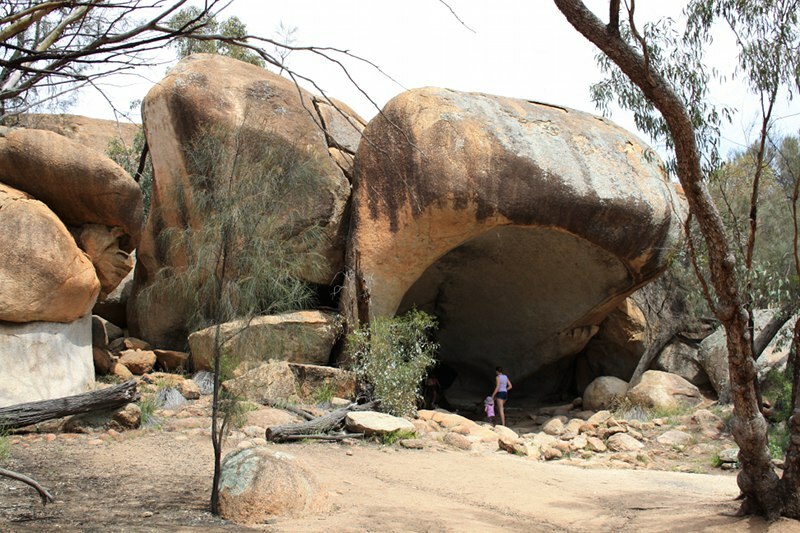 We had a full day to explore, climbing up by the dam, around the base to Hippo’s Yawn , a walk through the surrounding country (complete with the often-cited “carpet of wildflowers”, birds, lizards and many, many flies) and a short drive to Mulka’s Cave to view the Rock Art. 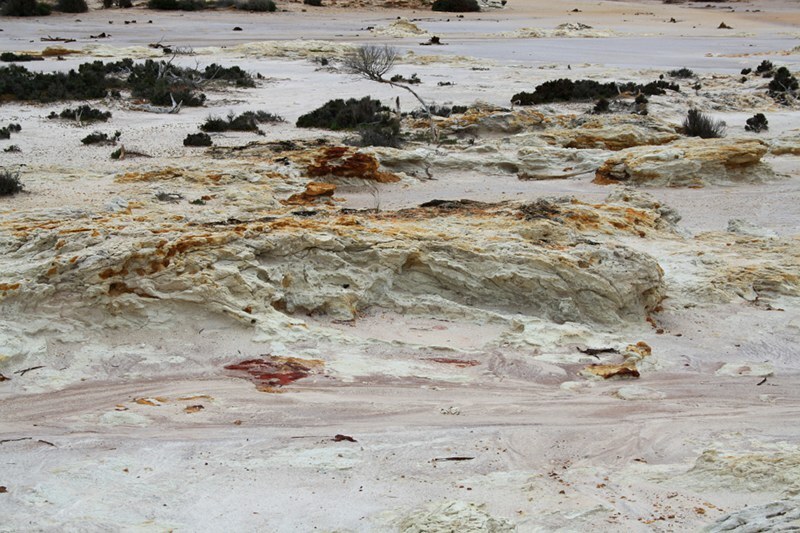 Next day we drove south, past the amazing colours and textures of the salt lakes around Lake Grace. This crusty desolate-looking landscape was only metres from wheatfields on just slightly higher land. 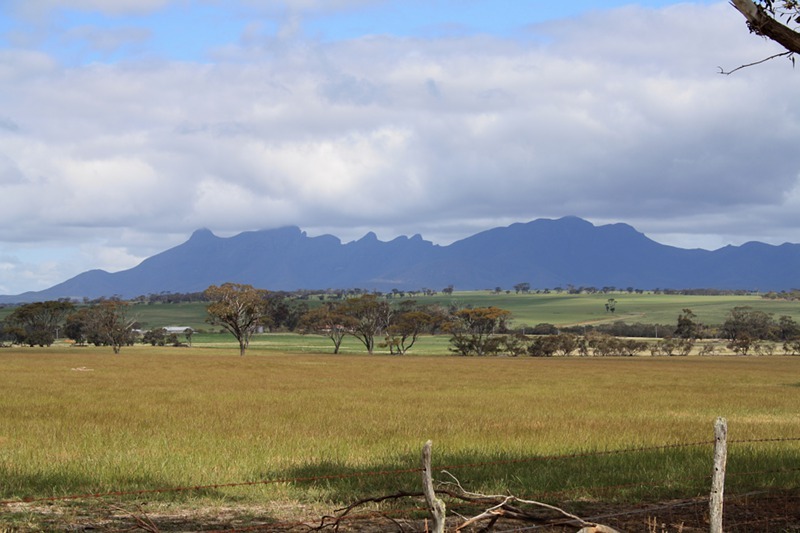 In the township of Lake Grace we visited the Australian Inland Mission Hospital Museum, then on through the Stirling Range to the port of Albany where we arrived in time for a dusk walk around the old parts of the town. The highlight of the next day was the Valley of the Giants near Walpole. 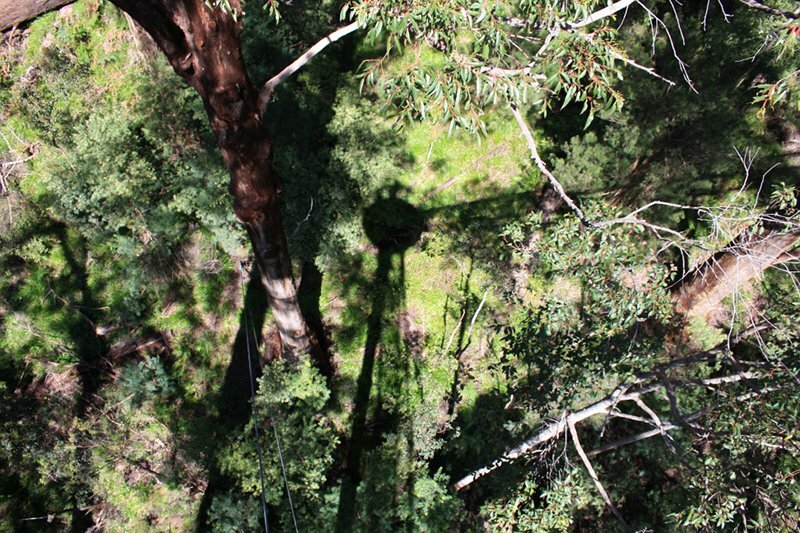 The link has a video which gives an idea of the 40 metre high pathway among the trees – you can see its shadow on the ground below in my photo. 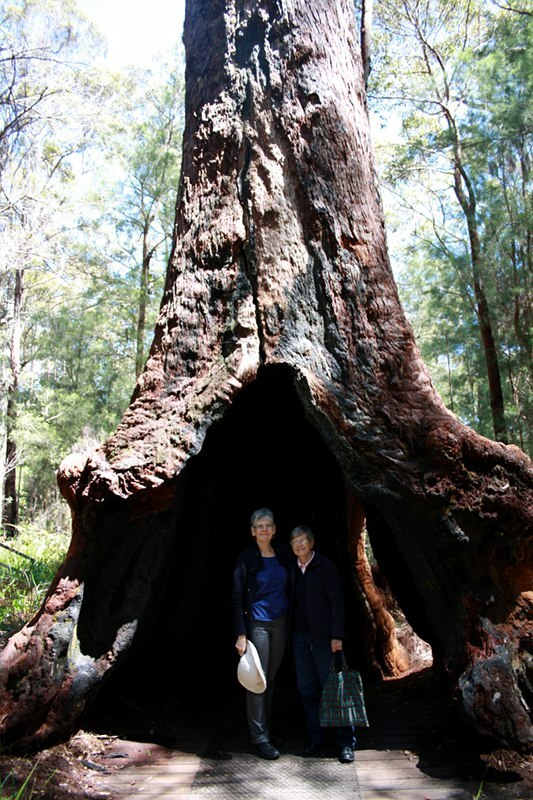 The second part of the walk took us down and around the trees, where mum and I posed for the obligatory photo. 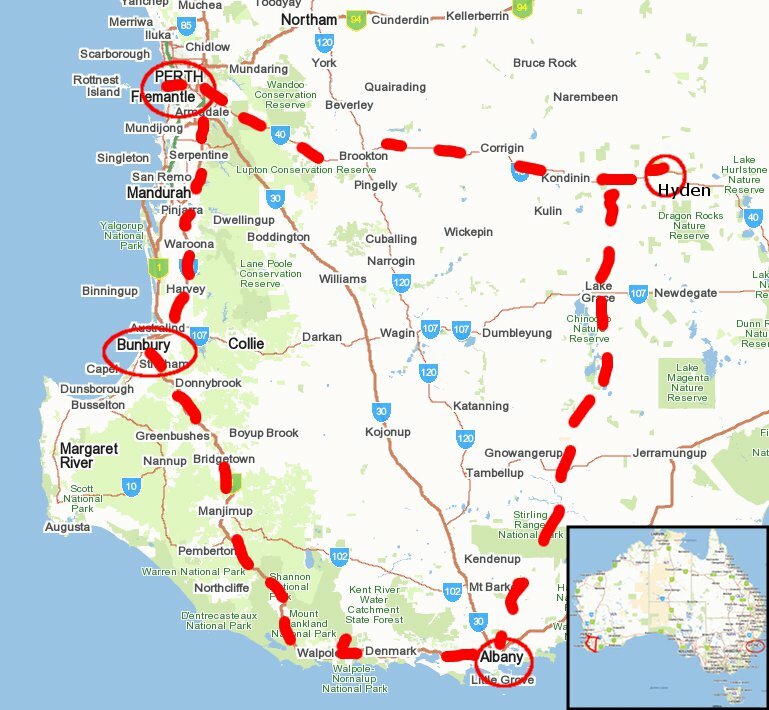 Driving on, we had our picnic lunch at a lookout over the Great Australian Bight towards the Southern Ocean, then reached Bunbury in time for dinner watching sunset over the Indian Ocean. 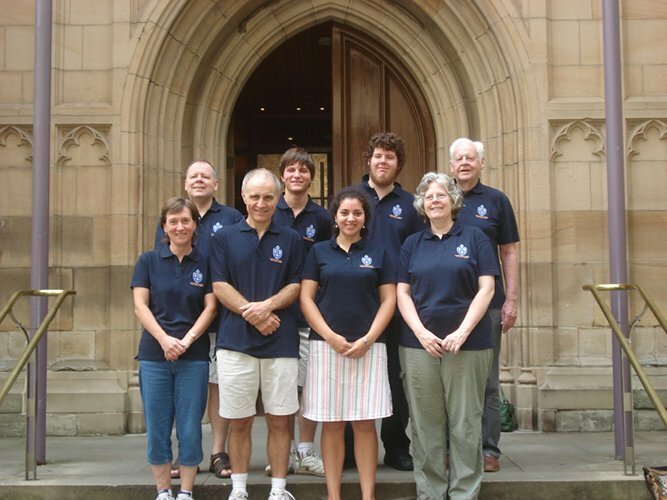 In the morning we drove on to Perth in time for midday ringing at the Bell Tower. No photos, so follow the link or even better, go visit when you’re in Perth. My mother, who has been ringing since 1940-something, was really excited to be able to watch the bells swinging – normally we just see ropes vanishing through holes in a ceiling, but here you can go up to the level of the bells and see it all happen (with very effective soundproof glass so you can still have a conversation). It was really fun to chat with visitors and explain some of the finer points of our usually invisible but highly audible craft. The rest of the day was a stroll through Perth followed by collapsing in our apartment. Morning coffee with mum’s god-daughter was followed by a sobering visit to the Katta Djinoong gallery at the Western Australian Museum, learning about the history and culture of Aboriginal peoples of Western Australia. Harsh and all too common stories. The gallery name means “see and understand us” and perhaps I was able to, at least a little. The afternoon, in total contrast, we spent at the Princely Treasures exhibition at the Art Gallery. The beautiful, opulent pieces from the Victoria and Albert Museum were magnificent, but rather cold and impersonal after the morning’s experience. It was all about flaunting power and prestige – which is not to say I didn’t admire the beauty and craftsmanship displayed, in particular a bed cover and a table top spinning wheel. 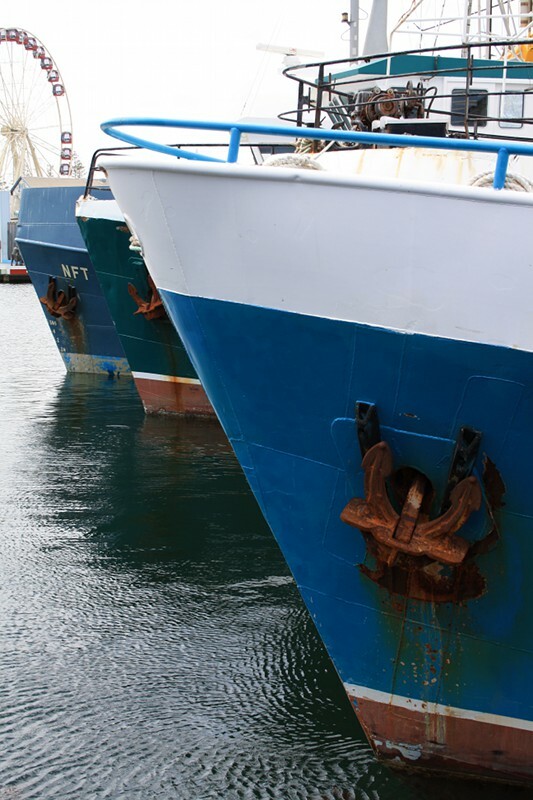 The next day we spent in Fremantle where I indulged my fascination with rust, but our primary focus was the Shipwreck Galleries, part of the Western Australian Museum, and in particular the Batavia (wrecked in 1629). The large exhibit was timbers from the ship that have been reconstructed on a steel frame, but for me the most exciting were actual textile fragments – lace (and lace bobbins), twill, and knit. The lace was found in concretion and there was sufficient for Rosemary Shepherd to produce a pattern. Our final day was spent in Kings Park and Botanic Garden. 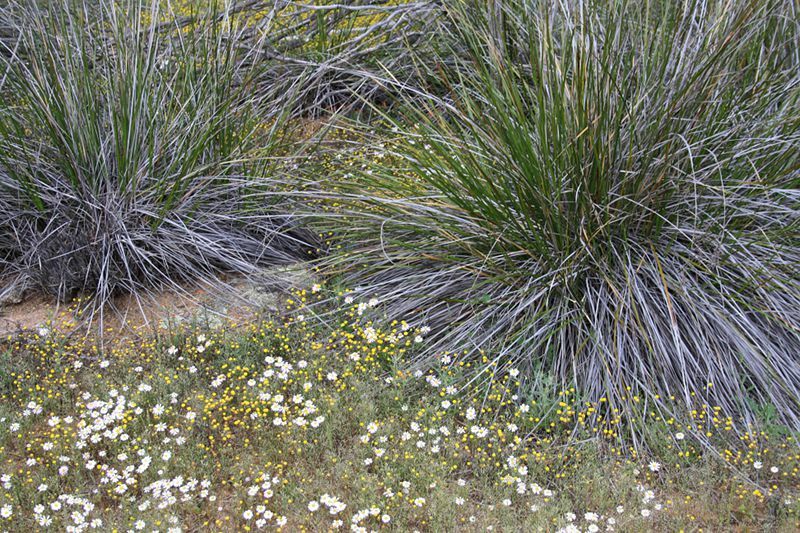 Great views over Perth and an amazing variety of plants. One disappointment was the very nice shop, Aspects of Kings Park. I made a point of going in to see Shirley Treasure‘s weaving. Her work didn’t disappoint and there were other talented textile artists represented – but I felt the manner of “display” did them a grave disservice. Work was stored in large drawers, in a general jumble. Bits were trailing out higgledy-piggledy, very difficult to see and appreciate – and I was making a conscious effort! Another issue for me came up when browsing the jewellery, where many of the artists came from interstate. I would have preferred that the gallery did more editing of their artists and concentrate on those of Western Australia and presenting them really well, rather than cramming in so much. We had a wonderful holiday. We ticked off everything on our “must do” list and were left wanting more time to explore everywhere we went. On the flight home I re-read all my OCA course notes from the beginning – and was left feeling I’ve strayed from the path in the latest exercises. I did do a little sketching and stitching while away, plus take heaps of photos of texture – rust, rocks, bark, flowers… But that’s a topic for another day. Back in February inspiration struck – could I represent complex bellringing methods using supplementary warp floats? I did some sampling – the idea held some promise if only I could get the right sett. Advice from Liz and the weaving group was very welcome. In March I was dyeing yarn, then redyeing! 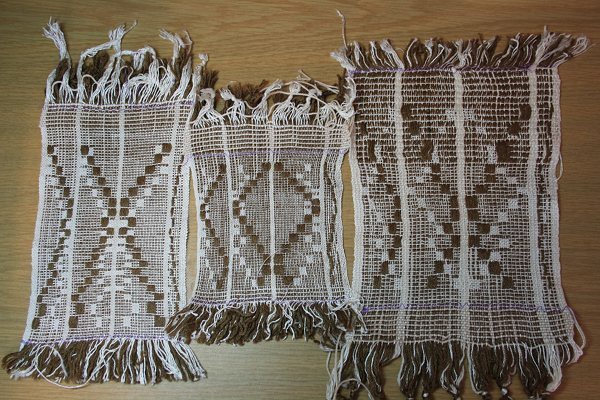 However the weaving didn’t go well. The first few centimetres looked streaky, obscuring the patterning. Weeks passed, some pleasant (Forum in Orange), some less so (virus in tummy). Finally I bit the bullet, and on Monday unwove all that had been done and resleyed. 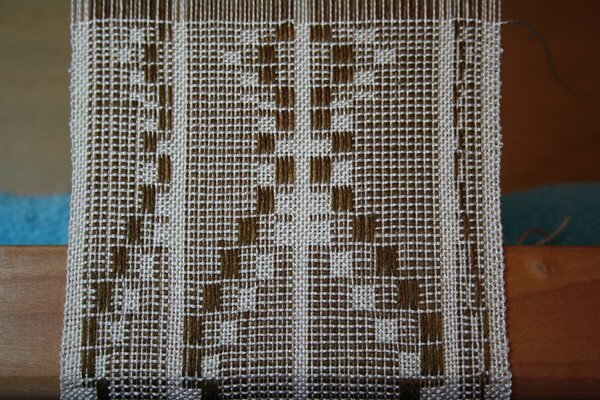 Weaving restarted, all looked well – until I realised I had mucked up the ringing pattern. There is still some streakiness, but the patterning is clear and readable (I tested it on the other ringers this morning). 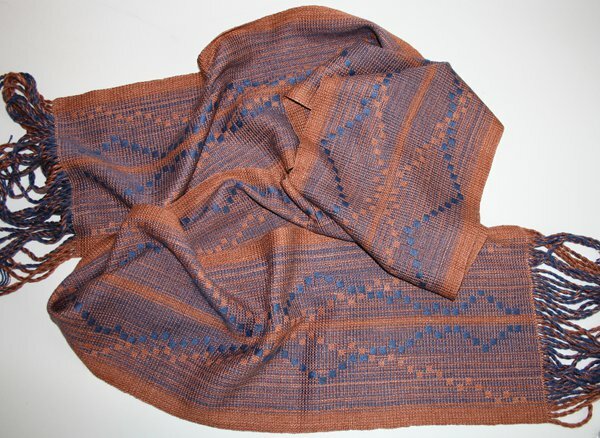 The hand and drape of the cloth is good and with finished measurements 184 by 19.5 cm plus fringe it’s a great weight and size to wrap around the neck in Sydney’s autumn. I was able to include 4 leads of Bristol Maximus – a ringing pattern with 12 bells. 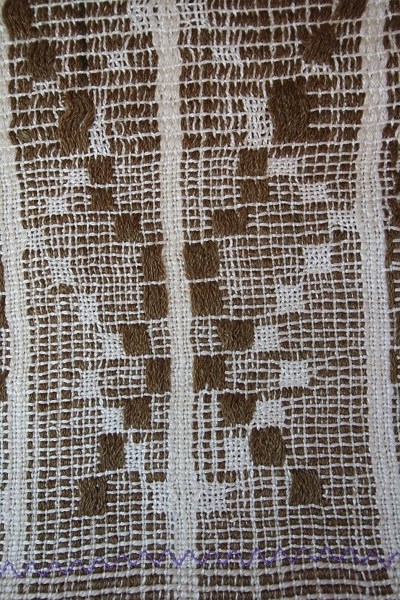 The brown ground cloth squares show the path of the treble (highest note) – it follows a path ringing first, then 2nd, then first, 2nd, 3rd, 4th, 3rd, 4th, 5th, 6th etc, forming a jagged but regular line going from 1st to 12th and back 4 times. The blue supplementary warp float blocks show the path of one other bell – it could be any of the other 11 bells since they all follow the same Bristol Maximus pattern, just starting at different points (it’s a bit like 4 people singing “row row row your boat” in rounds). If you’re a ringer and the photo doesn’t quite look right, the pattern is mirrored and doesn’t start exactly at a lead end. After all the palaver it was pleasant to weave. I did some experiments at the end of the warp to see if I could further reduce the streakiness and did manage to get improvements, but only with a lot of fuss lifting and manually clearing sheds that I didn’t actually weave in order to keep the ground and supplementary warps in proper alignment. Given I like the final scarf, the cost/benefit of the extra fussing isn’t worth it. Maybe playing around with reed size and denting would be useful if I revisit this. Focus. Yes. (now everything has an ess, and this was not deliberate). I’ve spent some time the last few days seeing if my bus inspiration actually holds water – will the design be readable and will the cloth drape for a scarf? Here’s version 1 on the loom. Base warp is 20/2 silk. Supplementary warp a silk merino 2 ply, 650m/100g (the supplier closed her small dyeing business a while back). 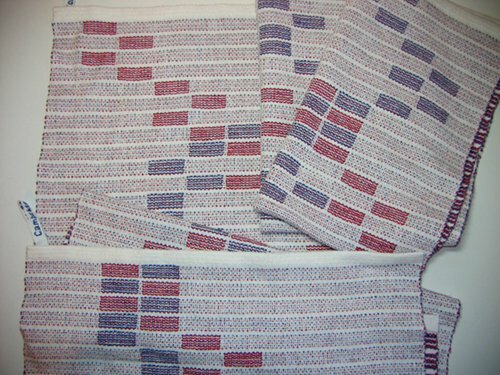 Sett 40 ends per inch (20 of each warp type), except in the selvedge area and breaks between pattern areas. The threading is pretty much the original idea seen at the bottom here, but with variations on the number of supplementary threads per block. From left to right I tried 3, 4, 5 and 1 threads. 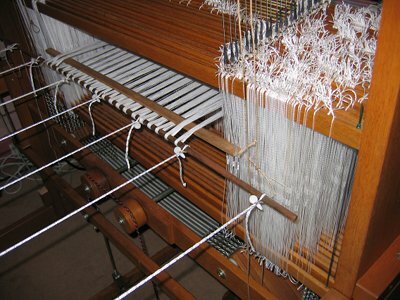 Weft was 20/2 silk. I didn’t pay much attention to picks per inch – just standard comfortable not light or heavy. As I was weaving I tried a few different numbers of repeats/length of warp floats. Version 2 had warp unchanged, but 60/2 silk for weft. Here are versions 3 (at bottom) and 4 on the loom. I resleyed to 30 ends per inch – 15 background warp plus 15 supplementary. I also added some undyed merino-silk to the selvedge/pattern break areas, so they would feel more consistent with the rest of the cloth and cope better with the more open sett. I made a major hash of this, threading the new warp ends in with the same heddles as the base cloth. Plus the back of the loom became a rats nest as my supplementary warp got short (I was using thrums from Geoff’s scarf). Not a pretty sight (the camera seems to agree – the colour went very odd). 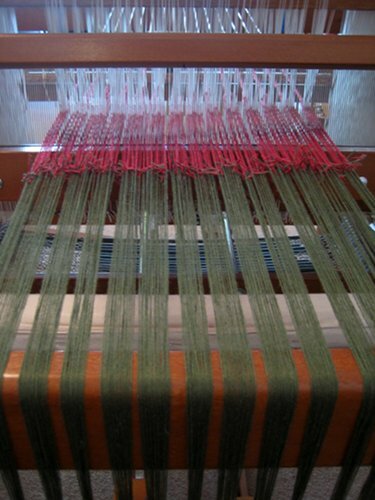 I kept to the 20/2 silk for weft, but tried both my default beat (which worked out around 17 picks per inch) and a deliberately light beat towards the end (around 11 picks per inch on the loom). 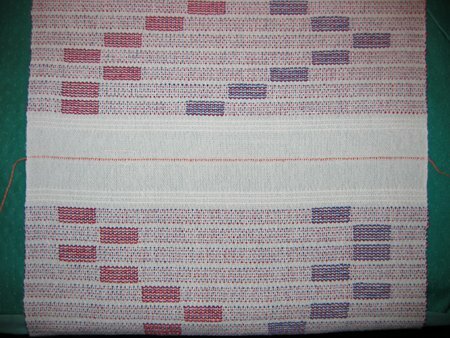 The washed and pressed samples together – left to right samples, 1, 2, then 4 above 3. All have good definition of the design, with the brown float/white background/mixed plain weave areas clear, even in the unpleasantly sleazy sample 4. The big issue was getting a nice scarf drape. I really like the final sample 1 cloth, but it’s too firm for the purpose. I’d like to return to it another time, maybe as part of a light jacket (the patterning could be a bit strong all over). Sample 2 draped a little better, but not enough plus I think the finer silk brings a slight harshness. Jumping to sample 4, this actually feels nice but is crazy-sleazy. So, we have a winner. Cue close up of sample 3. Overlook the fact that end-of -warp issues have introduced a few oddities. The drape and hand are nice, and (I hope!) suitable if not perfect for a scarf. The floats cover the background quite well. 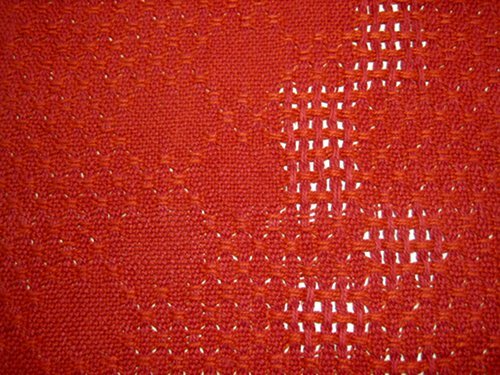 There is some deflection of the warp and weft around the background areas. I rather like the irregularities – not sure how much will be in the final, given a better tensioned warp. 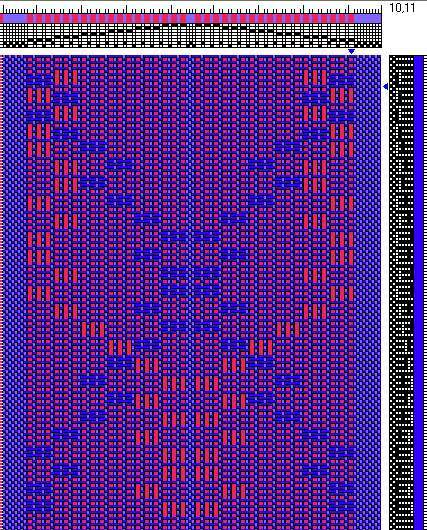 In any case the pattern is quite distinct (it’s not any actual bellringing method, just playing around). Colours are chosen, so the next step is calculations of lengths and weights for dyeing. Inspiration strikes on the bus? * able to show the path of one “working” bell, plus if possible the “hunt” bell. 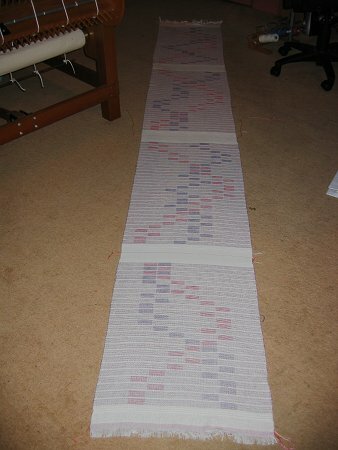 The picture on the right gives the idea (this pattern is part of “Bristol Surprise Maximus”, and the diagram was created using http://www.boojum.org.uk). The red “hunt” bell line follows a very regular pattern, jagging from left to right and back. The blue “working” bell is irregular. 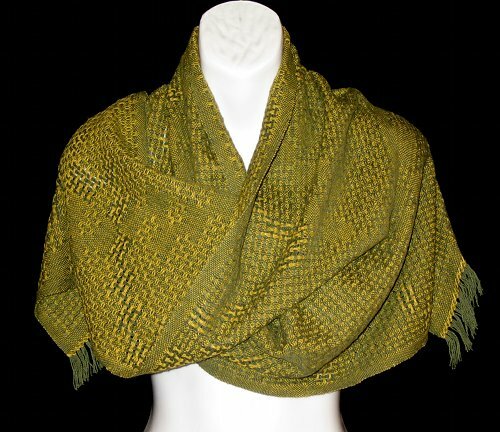 * a nicely draping scarf, based on 20/2 silk. * as few shafts as possible – limited to 24, since that’s what I have. * preferably a one shuttle weave. I’ve woven “bellringing” in a number of structures before. Huck gave me lace for the working bell, plain weave for the hunt bell and huck texture for the rest, but would need 26 shafts for 12 bells. Summer and winter in cottolin with two pattern wefts worked well with towels, but I wasn’t keen on the 3 shuttles and wondering about drape-ability. I’ve also woven with a variant of overshot (blogged at the end of this post) – maybe, but I’m not feeling it. This explanation is so long!! And the idea was so fast and I think may work. If I have a base weave (say blue 20/2 silk plain weave and supplementary warps (say a nice plump merino/silk in red), then I can have 3 colours in an area. 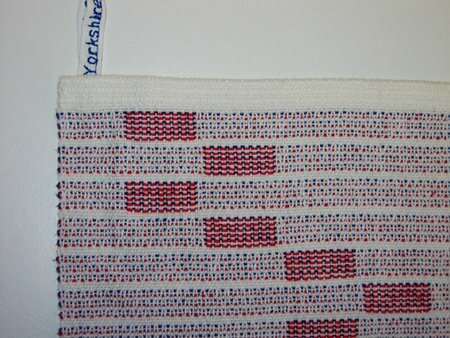 This is a quick trial in fibreworks – 6 bells so I can sample on my 8 shaft loom. This is “Cambridge Minor” (I now realise a confusing change of colours to blue for hunt bell and red for working bell). * supplementary warp woven in – call it purple. I’d need 2 shafts for the plain weave plus 1 for each bell position. In the trial I mirrored the method across the warp, just for a better visual balance. The “tangle waiting to happen” in my post here never eventuated. 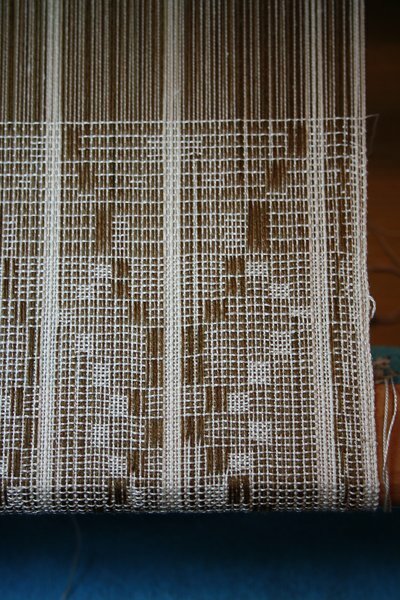 The cottolin behaved beautifully and my first attempt at tieing on a warp went smoothly – the sort of thing you hope for, but rather a surprise if it actually happens! The plan was another bellringing huck lace scarf. 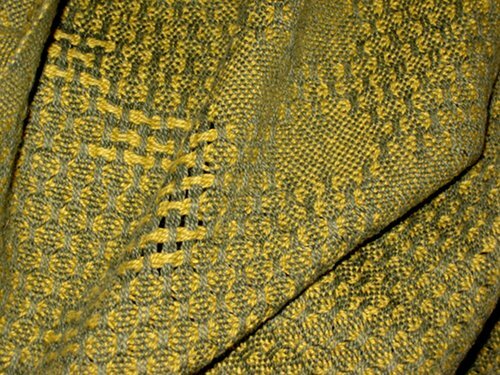 The last one used two very similar colours for warp and weft (same link) so this time I decided to try for a bit more contrast with a golden-green weft. 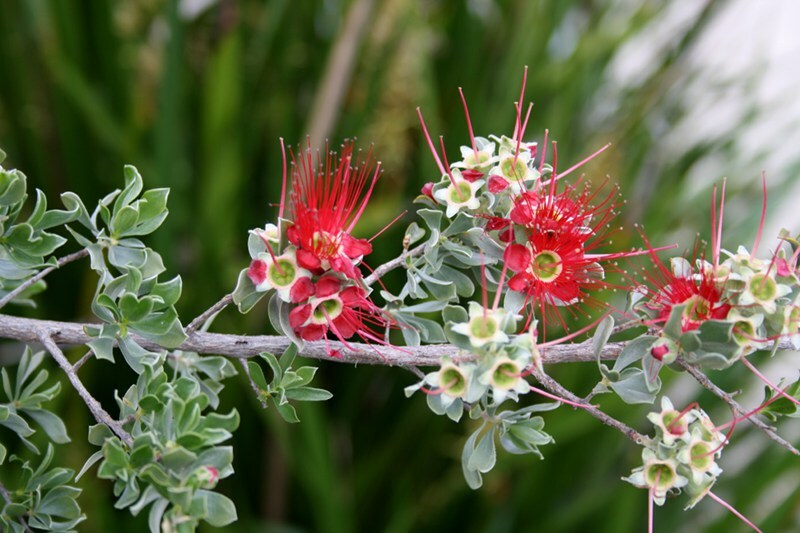 Green and gold are Australia’s national colours, so I stuck to the theme and did some research to find “Wattle Surprise Major” – wattle being our national flower, and of course green and gold. I was a bit worried the final result would be a bit too “Aussie, Aussie, Aussie, Oi, Oi, Oi” (I feel enormously proud and lucky to be Australian, but don’t see the need for overt patriotism or saccarine sentimentality). I love the result, and there’s not a whiff of Oi! or syrup about it. The actual weaving was a real pleasure. I’m still using the “double treadle” workaround, but my footwork continues to improve and I had very few clatters of half-lifted shafts. The key is to lift my foot off the treadle, not let the foot ride up. Another improvement I’m pleased about was in weave file preparation. I was finding it very fiddley to edit the weave draft in fiberworks. Instead I took the wif file from the Killamarsh scarf, and used an excel spreadsheet and a series of lookups and if statements to generate a new Wattle wif. I don’t think there’s a lot of demand in the world for a “huck lace bellringing method weave draft generator” – but if there is they’ll be beating a path to my door! I first played with this idea at the beginning of the year (blogged here) – bellringing methods interpreted in huck lace. One of my ringing friends asked me to make scarf as a Christmas gift for his mother, using “Killamarsh Surprise Major” as the pattern. Johnathon chose two reds from my stash of cottolin, one verging on orange, the other a bit bluer. 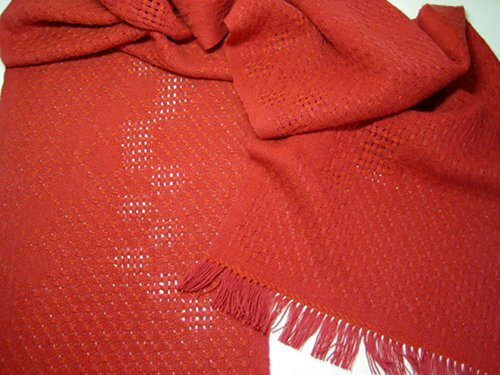 The variation in texture – plain weave, spots and full lace – plus the slightly different colours in warp and weft create a gentle interest through the cloth. I’m not sure if you’ll be able to see the movement of the plain weave (representing the treble or highest bell) and lace (the path of a “working” bell). In the original piece I had trouble with shafts sticking. I had trouble again with the deflected double weave (blogged here), but that was likely largely due to my woeful warping job. Before starting this project I opened up the loom’s control box and tested all the solenoids – no problems there. I warped carefully and think I got a reasonably even tension. 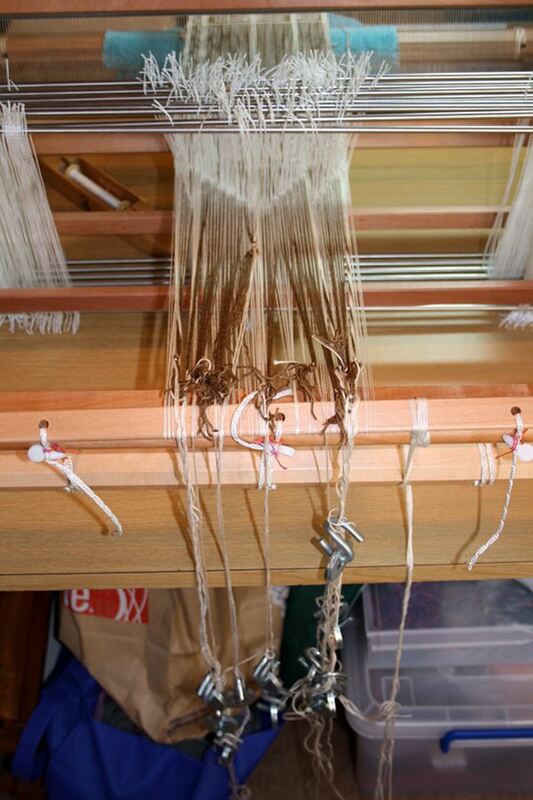 I started weaving the header – and got sticking. One possibility is that the loom needs adjusting. There’s some uneven tension in the cables that go past the control box and up to lift the shafts. However it’s not clear the best way to adjust that – and I felt a more likely suspect (and certainly a contributing factor) was user error (ie me). 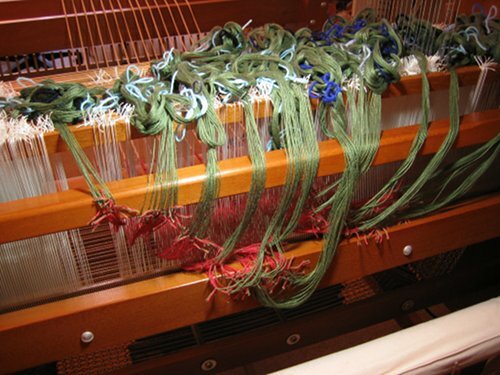 In my very first work on this loom I had similar challenges and improvements in my treadling technique made a huge difference – lifting my feet and treading crisply. I needed to practice and improve my technique and rhythm – but I didn’t want to ignore mistakes or to continually interrupt myself by unweaving. My solution was not elegant, but it was effective. I added a blank lift between every actual lift of the shafts. So for each pick I pressed the treadle twice – once for the real lift, once a “blank” which shook out any sticky shafts. Every once in a while a shaft would lift or half lift on a “blank” and the movement would unstick things. So the next real lift would be clean. It worked! I didn’t have to do any unweaving, I don’t think I had any bad real lifts, and I could focus on working smoothly. It’s not a permanent solution and it would be hopelessly inefficient for a production weaver – but it gives me my chance to learn. It was a pleasure to weave instead of a struggle. I’m keen for more, so I decided to try another new thing – tying on a new warp to the old threading. Currently it looks rather scarey and a huge tangle just waiting to happen – time will tell.